Sunrises and sunsets are one of my life’s addictions. One of my healthier ones. I’ll never get enough of them. I try to pause, think, reflect, relax and use them to appreciate that which has come my way. 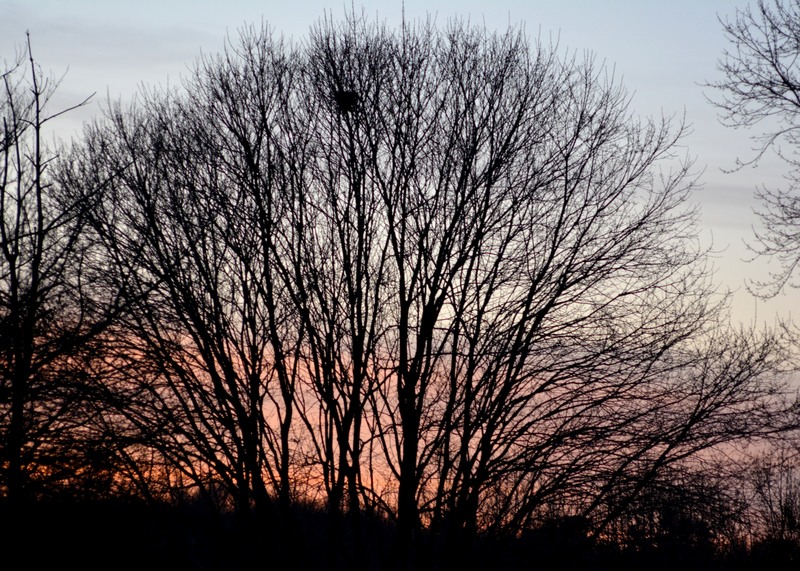 This transition time when the sun is stronger, warmer and contrasted still against the bare trees is a nice time of year. Soon leaves will fill the space across the street. But somehow these views are still beautiful all year-long from my front porch. I certainly haven’t taken full advantage of that position. When I do there is an utter relaxation and peace that has been one of the many moments in this home that I had envisioned before we came here. My better half and I have always admired homes with front or even wrap around porches. Ones with swings maybe or a wood cut banister. Maybe a few old style wooden rockers. Anyway I digress, we have a small and quaint porch and it has two fairly comfortable outdoor chairs with a table between them. But its our porch and it gives me strength. I’ve sat on it and watched my children come and go. I’ve sat there after mowing the yard for 3-4 hours on a HOT summer day and caught my wind. And I’ve always been able to bolt off the porch with a burst of renewed energy. I’ve rested there on FREEZING days after shoveling my driveway for hours. I’ve listened to music on the old Walkman and lost myself in the tunes on a fall evening. I’ve stood there and watched huge thunderstorms roll over with lightning displays. I wave goodbye to my better half as she leaves for work as she does for me. It’s a small section of concrete with some white pillars and a few chairs with cushions surrounded by a small garden area and a dogwood tree. And its been mine for almost the last three decades and it is one of the many views I have from my home that I’m in love with. But really I’m just in love with the many memories it has given me that are movies in my mind I can draw from when needed. Especially that one where it’s that hot summer day and I’ve been working outside an my better half comes home with the big cherry snowball and I get to sit there and try unsuccessfully not to get brain freeze. Then again stringing the Christmas lights up each winter is also one that I like to. Oh yeah the sounds of the wind chimes. Or watching the bee’s go from flower to flower or the squirrels sprinting from the two oak trees in my front yard. Then there is the many memories of my pet waiting for me at the door as I step up to the porch. And many others that I think about it now. I hope you have a front porch in your life. A family that drinks together, smiles together. 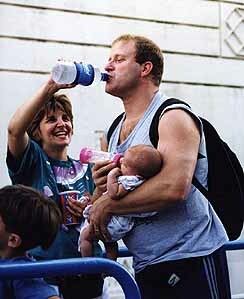 Just an old photo I took of a family in line at Hershey Park. You can’t beat weather like this. 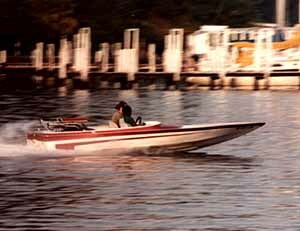 So crank up them engines and let the good times roll. I shot this maybe 4 decades ago on my best friends dock, on St Leonard creek. I have spent many a day with them and greatly enjoyed their family sharing that bay lifestyle with me. Boating, swimming, crabbing, fishing. And rumors of some huge fun fest that I have no knowledge of. Had a wonderful dinner at Ernesto’s in Enchanted Forrest recently with my better half. The place really hops and I’m glad to see it doing well because I like having a good Mexican restaurant close by to home. Would recommend it highly. Had a great server also. I think his name was Louis. Also stopped by Shannon’s a few weeks ago and had a wonderful dinner. That place never disappoints and its great service compliments the fine food. And while I can’t wait till Mission BBQ opens to try that because I love BBQ, I won’t go without saying that Canopy has been a mainstay in this county for ages and I still am very pleased with the quality of their products. My better half doesn’t realize I just use twice a much light mayonnaise as I would if I just had real mayonnaise. One of these days I’d like to stop worrying about how much money it takes to retire and just retire. Many people don’t know what an inter-grill part of the house your hot water heater is. I’m going to pursue a tip I saw on another blog, read a page of the manual each day. Now if I could find the manual. If you keep an old style desk calendar you can start to get an idea of how fast time really flies. Read a post from a young lady saying don’t be afraid of making mistakes. Obviously we have never worked at the same place. But I do agree with her in life in general about not being afraid to try, and fail. Sometimes words flow. Don’t know if they have the right effect, but sometimes they just seem to flow and it makes me feel at ease at least.